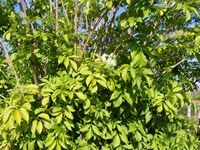 Deciduous bushy shrub, serrated bright, yellow-green leaves - become lime-green in summer. Fragrant star-shaped cream-white flowers, black fruits. 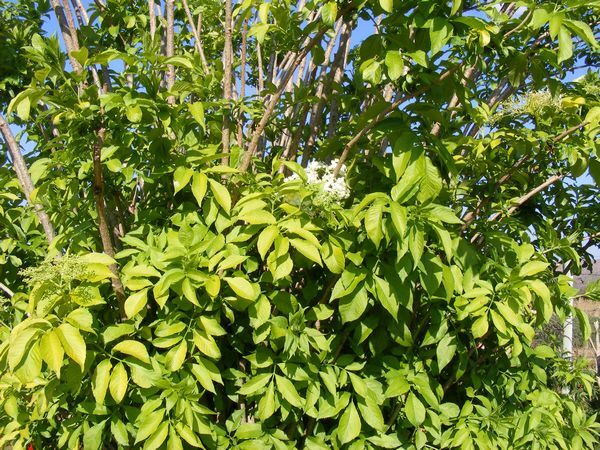 Do not prune too hard if flowers and fruit are required. Flowers - coated with thin batter, deep fried. Berries - jams, jelly, salad, pies, pudding. Leaves, bark, open flower heads and ripe berries. Immune stimulant: coughs, colds, flu, chronic catarrh, ear infections, allergies. Promotes perspiration that helps reduce fever. Flowers tone mucous linings of the nose and throat. Infusion of flowers taken before the hay fever season, reduce allergy symptoms. Berries rich in vitamin C.
Bark: Liver stimulant, stubborn constipation and arthritic conditions. Strongly purgative - do not use bark in during pregnancy.